Disasters, natural or human-made, cause demand for communications to spike at precisely the time when the supply can drop perilously close to zero. As global intelligence and warfighting operations are conducted increasingly through unmanned aircraft, the military is re-evaluating its future data and communication technology needs to support these efforts. Secure and Resilient Free-Space Optical Communications: A Bridgesat Perspective, by David Mitlyng, Senior Vice President, Business Development and Strategy, BridgeSat, Inc.
Free space optical (laser) communications' systems are ideally suited to provide the secure, resilient, high-bandwidth communications demanded by today’s Warfighter and MILSATCOM community. 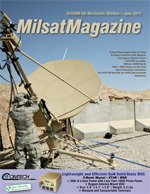 Communicating with satellites is immensely versatile as there are so many options for applications, bands and service tiers. Hollywood loves to use the old cliché where an underestimated individual fights to get everyone’s attention because — as the audience is already aware — they have the solution to the big problem that has everyone in danger. I had a chance to meet with the Hosted Payload Alliance during this year's Space Symposium in Colorado Springs to speak about the Space Enterprise Consortium. The need for satellite communications (SATCOM) in Australia and the APAC (APAX) region continues to increase.